Because watching it at home just won't be the same. Dunkirk is the cinematic mic drop by Christopher Nolan -- 106 minutes of sound, fury and if you're lucky glorious 70mm IMAX film. It's a movie that uses all of the latest technology to not only show you the relentless horror of war but also make you feel as if you're right there alongside the steadfast British soldiers. And it's the best argument yet for why movies should be experienced on massive screens, with sound systems that would get you evicted. 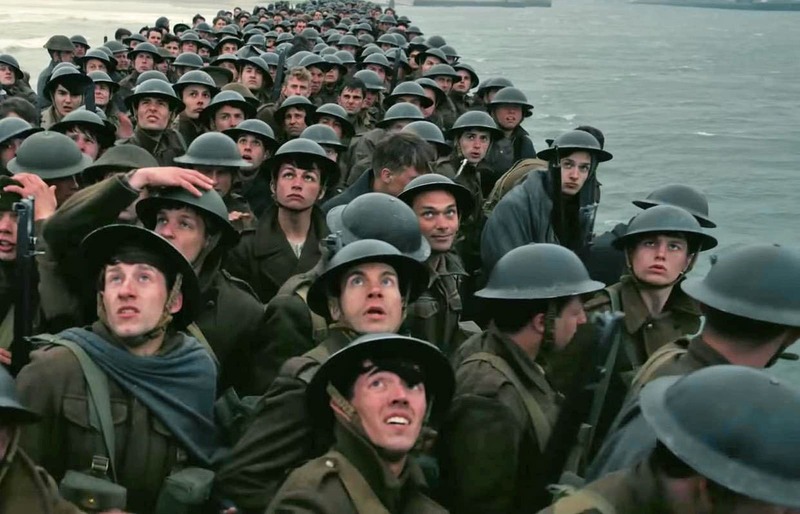 War films have been around since the dawn of cinema, but Dunkirk's biggest achievement is that it doesn't look like anything in the genre we've seen before. Indeed, Nolan's use of huge 70mm IMAX film makes it stand apart from any other movie I've seen. He's toyed with the technology previously -- first in a few scenes for The Dark Knight and its follow-up, The Dark Knight Rises. Several years ago, he used it to transport us through a wormhole and into another galaxy with Interstellar. But those films used the format as a way to whet your appetite for the format's potential. Dunkirk, on the other hand, is primarily a large-scale experience, with around 75 percent of the film shot on 65mm IMAX film (the other 5mm of the 70mm real holds the soundtracks). The rest of the film was shot on 65mm Panavision stock, which is still significantly larger than standard 35mm film. Right from the start, the film takes full advantage of the full size of the IMAX frame. We see a group of soldiers walking down a quaint European street with leaflets raining down on them. It's an evocative shot no matter how you look at it, but on an extra-tall IMAX screen (which has a slightly more square aspect ratio than traditional cinemas), it's as if you're caught in a sudden paper downpour. It's so enveloping that it's almost like wearing a VR headset. That's especially true of the segments where we're following British Spitfire pilots as they patrol the English Channel. Just seeing those World War II-era planes taking up the enormous screen, heading towards an endless horizon, was enough to make me tear up a bit. But once they encounter the enemy, Dunkirk uses the power of IMAX to deliver some of the most immersive dogfights put to film. You'll find yourself leaning in your seat with every maneuver, especially during the shots from IMAX cameras planted directly on the plane's wings. I still get the chills of vertigo. Dunkirk's aggressive audio mix -- which can hop between silence to deafening gunshots and explosions at the drop of a hat -- complements the visuals. Nolan doesn't break new ground, but the sound design is still impressive, taking full advantage of the powerful subwoofers and speakers in IMAX cinemas. Hans Zimmer's score, as usual, drives home the tension and anxiety of every scene. At certain points, I had a hard time telling the difference between the explosions on the screen and the pounding music -- which is probably the point. Nolan has described Dunkirk as a film that's meant to be immersive. There's little dialog, not much backstory and we see only glimpses of the German soldiers keeping the English and French under fire. So for this movie, more so than most, the experience of seeing it in a theater is particularly important. Sure, you can see Dunkirk on your laptop, TV, or, heaven forbid, your phone. But are you really seeing and hearing what it's trying to convey? Nolan has also made it very clear he doesn't care much for Netflix, both as a service to watch films and as a platform for budding filmmakers. "Netflix has a bizarre aversion to supporting theatrical films," he told Indiewire. "They have this mindless policy of everything having to be simultaneously streamed and released, which is obviously an untenable model for theatrical presentation. So they're not even getting in the game, and I think they're missing a huge opportunity." He goes on to praise Amazon, which releases its films theatrically before placing them online. The director's comments might seem elitist and out of touch with the way we consume most media today. But, when watching a film like Dunkirk, it's hard not to see his point. There's something special about losing yourself to a film in a theater, where the screen is huge and you're not distracted by any gadgets. Cinema demands patience and attention. And with the rise of digital media, that's easy to forget.